hibernate during the winter, they grow warmer coats of fur and typically stay inside their dens for extended periods of time to avoid the bad weather. The orange animals are now venturing out of their dens in search of food after a limber spring, making it important to know whether foxes are dangerous or not. Foxes are more like dogs than cats and exhibit solitary behavior which decreases their aggressiveness and threat to begin with. 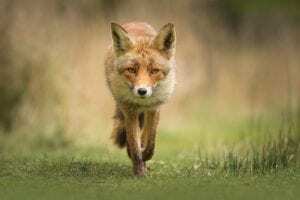 Due to their slight stature and lack of dangerous weapons against bigger prey, foxes are far more likely to run away from any human than they are to even approach one, let alone pose a threat. The exception to this rule may be if a fox is defending their young or territory, but even still, a human can remove themselves from that situation by simply walking away and even the most foolish fox would not follow after. Although foxes are known for killing small animals, they are actually omnivores, making plants a large part of their diet. Foxes can eat berries, nuts and other similar food sources in addition to their typical meals of rabbits, lizards, rats, birds, bugs or any other small, vulnerable animal which cannot defend itself against the much bigger fox. As such, foxes run into trouble with humans when they may threaten the well-being of a pet or livestock. The most common pets, cats and dogs, are extremely unlikely to be the subject of a fax attack, as those animals are not prey for foxes. If a dog is encroaching on a fox’s territory or vice-versa, an ugly power struggle could occur, but barring that situation, safety is not a concern for cats and dogs. For people who have livestock on their property such as chickens, though, foxes are known to overpower and eat young animals of many species, but chickens in particular are a common target. For the most part, foxes do not pose a significant safety threat to either humans or pets, save for rabbits or young livestock. Like any animal, though, foxes will resort to violence when threatened, so it is a good idea to leave them alone even if they are present on your property, or to call an animal removal service. At Shumaker Animal Control, we are a family-owned business who cares about the safety of you and your family but also about the well-being of the animals themselves. All of our trapping and control methods are humane, as we never try to hurt the angry or scared animal. This entry was posted on Wednesday, April 10th, 2019	at 7:08 pm	. You can follow any responses to this entry through the RSS 2.0	feed. Both comments and pings are currently closed.